For a model that was released in 2012 has a lot of great features into a 1.89-inch long capsule that slips smoothly into a detachable silicone enclosed metal clip. It comes in two colors: burgundy and black. Most fitness trackers are worn on the wrist, but it wasn’t always that way. The original Fitbit was designed to be worn around the waist, directly in contact with the legs it was so keen on tracking. While all the attention is rightly on Fitbit’s more expensive wrist-based models – the Charge HR, Ionic, and Blaze – it is still possible to buy a clip-on Fitbit in 2018: the Fitbit One. But is it worth it? Let’s take a look. The one is a great companion if all you wish is to track your steps, calories burned, and stairs climbed. For those not interested in easily tracking sleep or relying on vibrating alarms to alert them during the day (and night) will find the One a great piece of fitness technology. It’s small, light, attractive, and it works pretty well. The Fitbit One features a slim, shiny, and cool design that combines an OLED display, with a vibration motor an accelerometer and an altimeter. The tracker comes with just one button that once you pressed will start to give you different metrics on the bright blue OLED display like the time of day, stairs climbed, steps taken, calories burned, and occasionally it offers encouraging personalized comments designed to keep the user moving. The One and the Zip where the first model to be able to communicate with Fitbit’s popular iOS app via Bluetooth (4s or newer and iPad 3rd gens, and the newest Android models) and to the Fitbit.com website via a wireless USB dongle on desktop computers. When connected, all the info shown on the One’s OLED display can also be viewed on an iPhone (or desktop computer) without even having to touch the One or remember which pocket it’s attached to. Something to have in mind is that The Clip-on fitness trackers are a little bit more difficult to wear all the time instead of a wristband watch that you are going to have all day attached you may forget the clip on tracker on some clothe or bag. On the other hand, this type of trackers are more discreet. The latest trackers come with more flashy designs that the late Fitbit one, so in case you would like a more subtle tracker this is one to have in mind. The Fitbit One comes with a rubbery sheath with a stiff metal clip built into it. And as we said at the beginning comes in 2 different colors black and burgundy, and both colors are designed to not call attention. The one just like the Flex comes with some basic features but the one excels in some aspects like the Flex doesn’t have a screen to check your stats, with the One you can keep tabs on your progress at any time.Additionally, the Fitbit One uses a barometric altimeter to measure floors climbed, which is an especially rewarding metric to keep an eye on. A big difference from the Flex is that the lack of screen makes you have to check the app post-sync to keep tabs on your progress, while the Fitbit One lets you check at any time. Besides that the One and Flex track the same things steps, calories and distance traveled are all estimated in the same way, although the one is more accurate, given that the tracker is less likely to be thrown off by misreadings like the movement of your wrist that could get mistaken for exercise movements. That’s the most that we can say about the goodness of the Fitbit One since there’s no GPS built in or heart rate monitor. another downside for us is that the screen cant shows mobile notifications. It’s basic, but the upside is the great battery life. The company estimates 10 to 14 days, but on our test, the tracker was for 18 days without a charge. Having in mind that the average for other Fitbit devices is around the five-day mark, that’s very good indeed. The ONE uses the both the Fitbit iOS app and the website to collect all your data and fitness stats, You can also create your personalized username and log your metrics and your different stats like age, weight, and goals. But you can also add whatever you are taking like food, water so the tracker can get the most accurate data. When it comes to losing weight Fitbit provides you with a database of popular brand-name products along with their caloric values. By using this data Fitbit will give you a feedback on how many more calories you can eat during the day to reach your goal weight. After downloading the Fitbit app to your phone you need to simply click the “Join Fitbit” button and follow the onscreen prompts. Once you select the Fitbit One from the list of trackers, a four-digit code will be sent to your One that you need to put in the app to pair the device with Fitbit. Users are then prompted to provide a few pieces of personal info so Fitbit can “get an accurate picture of your activity.” These data points include height, gender, weight, age, along with a name and email address. After that everything is set. Those who don’t have an iPhone 4S or newer or supported Android phone, or prefer signing up on their computers, can use the included USB dongle to connect the One to their home computer wirelessly at Fitbit.com. There, users are directed to download a Fitbit installer for the One (Mac or Windows) that takes users down a similar path to signing up. With the USB dongle installed, the Fitbit app will automatically upload the most recent fitness data to the computer in the background anytime the One is in range of the computer. With this system running, the only task left for the user is to charge the One every four or five days. Earning our Top Pick for Clip-On award, the One is a great fitness tracker for the more casual user. But is the Fitbit One still worth buying in 2018? That depends on a few things. Someone who uses a more intense and rigorous training regime or someone who does a variety of activities besides walking and running may find this tracker lacking some features. 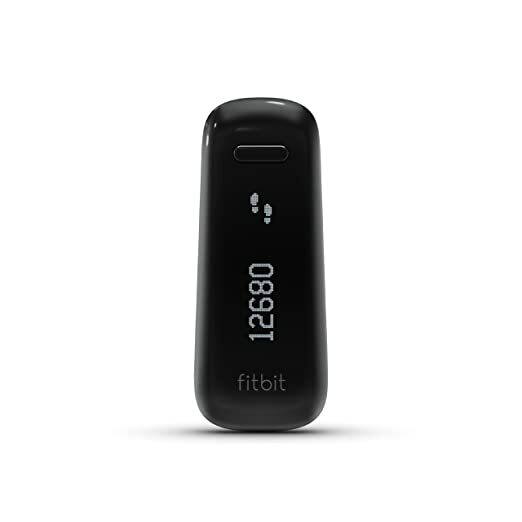 The Fitbit One is a good fit for those that are looking for a gadget that can track their sleep, count their stairs climbed, work towards their personal step goal, and maybe challenge a few friends along the way to get a more fun experience. So if all you need is track steps, calories burned, and stairs climbed, the Fitbit One could be your favorite tracker. But is not the best when it comes to tracking your sleep since you need to remember to strap it on every night what is something easy to forget.